High Knock in/out Rates in Aedes aegypti Expressing Cas9 from a Transgene. Li et al have published some interesting data on the preprint server bioRΧiv regarding the creation and use of Aedes aegypti lines expressing an SpCas9 transgene in the germline. The report substantial improvements in gRNA-mediated mutagenesis rates. Cas9 mediated mutagenesis methods are clearly enhancing insect functional genomics. The relatively high efficiency of SpCas9 leads to mutagenesis rates that are high enough to allow for rather cumbersome and slow PCR-based genotyping methods in order to find mutants of interest. While rates can be high in cells in which Cas9 and gRNAs are present, a significant challenge is delivering these components to the right cells. Often there are germ cells, but not always. Li et al. have created six stably transformed lines of Aedes aegypti (Liverpool line) in which SpCas9 was expressed in the germline, although not specifically in this tissue. The enhancer/promoters from the genes Exuperentia, trunk, Nup50, polyubiquitin, ubiquitin L40 and 4-nitrophenylphosphatase were used to drive expression of SpCas9. The authors designed these transgenes in a way that enabled them to visually check their functionality following integration. They did this by connecting the coding region of EGFP via the TA2 self-cleaving peptide. Drosophila melanogaster, ebony. Note the dark black cuticle. The authors evaluated these lines with respect to their effectiveness at creating knock out and knock in mutations by injecting a collection of gRNAs that specifically target a number of genes which, when mutated, are expected to result in morphological phenotypes that should be easily recognized. 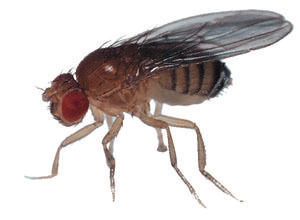 The genes specifically targeted were kynurenine hydroxylase, white, yellow, ebony, deformed, vestigial and sine oculis (ie the orthologs of D. melanogaster genes of same name). The reported rates of mutagenesis are impressive and the reader is encouraged to consult the pre-publication for details. Injecting multiple gRNAs designed to target a specific gene further increased the frequency of mutagenesis. Injecting mixtures of two or three gRNAs that specifically target different genes resulted in impressive numbers of double and even triple mutations. They report that some 90% of the insects surviving embryo injection had double mutations detectable. Sixty seven percent of the corresponding animals that were injected with three different guide RNAs had evidence of triple mutations. G1 animals coming from these Go germlines were of double or triple mutants. Finally, Li et al. found that the transgenic lines expressing Cas9 supported some 10-fold higher rates of knock in mutations. They report rates of about 2.5% at two different loci. Overall, the authors describe transgenic lines of Aedes aegypti that could significantly enhance functional genomic studies of this species. Their data are worth carefully considering.